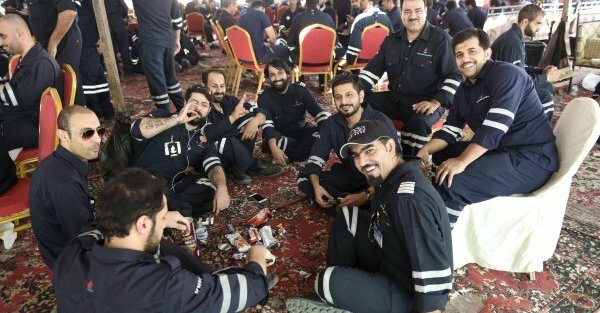 Over 13,000 oil workers in Kuwait have now been on strike for 3 days. Strikes are rare, exceedingly rare, in the oil producing oligarchies of the Gulf States. Whilst the oil workers have union rights, most workers who are migrants usually have appalling living conditions and no civil or trade union rights. This strike is the first major strike in Kuwait in many years. Although the last months have seen growing activity from a number of Kuwaiti unions in tourism and from municipal workers. There had been a flurry of public sector strikes back in September/ October 2011 leading on in November and December to street protests that led to the resignation of the Kuwaiti parliament. Then, after the Arab Spring, as now the strikes come at a time of crisis across the Gulf states. This time the crisis is economic as oil prices remain low and budgets of most of those countries go into major deficit. This entry was posted in Gulf states, Kuwait, Unions on April 19, 2016 by Pete Radcliff.